We’ve heard it all before, “You’re just a glorified waiter/waitress in the sky”. ‘Cart-tarts’, ‘Flight-deck floozies’, my own blog even brands us ‘Trolley Dollies’. True, we serve meals, pour tea and coffee, sell scratch-cards, hand out headphones and clean up after our beloved passengers. I sincerely hope for the rest of my flying career that this is all I have to do onboard an aircraft. Truth of the matter is, we as Cabin Crew, Flight Attendants, Stewards or Stewardesses are SO much more than that. I pray that passengers never actually have to see me do my real job. If they do, it means that one of them is ill, or something has happened to the aircraft and I am using some of the many skills I learnt during my extensive training to save their lives. On Saturday July 6, 2013, the crew of Asiana Airlines Flight 214, from Seoul Incheon Airport (ICN) to San Francisco (SFO), used these skills and their own professionalism to save the lives of 288 passengers. Onboard the Boeing 777-200ER (HL7742) were 291 passengers and 16 crew members. The 10 hour flight from Seoul had been uneventful. As the aircraft began its final descent into SFO, the flight attendant’s prepared the cabin for arrival, then took their jump seats and began to carry out what is called a 30 second review. During take off and landing, the ‘critical phases’ of flight, crew run through their emergency procedures and what we would do if the worst was to happen. What commands would we be shouting? What would we be doing with our doors? What equipment would we take off the aircraft with us? The Cabin Manager that day was 40-year old Lee Yoon-Hye. She had worked for Asiana for nearly 20 years and has since been hailed as one of the many heroes of that fateful flight. Speaking after the crash, Yoon-Hye said, “Right before touchdown I felt like the plane was trying to take-off. I was thinking ‘what’s happening?’ and then I felt a bang, that bang felt harder than a normal landing. It was a very big shock. Afterwards there was another shock and the plane swayed to the right and to the left”. Details later emerged of the final, terrifying moments before the B777 impacted the runway; as one of the pilots attempted to initiate a go-around, realising the aircraft was coming in too low and too slow. But it was too late. 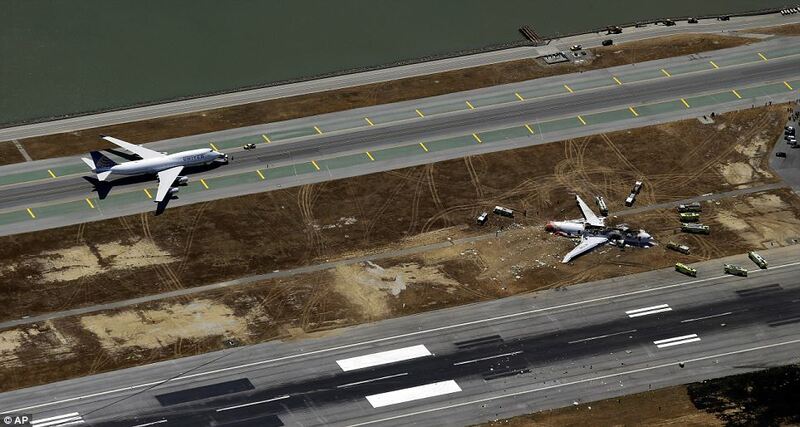 The planes undercarriage impacted the sea wall, before the fuselage slammed down onto the runway. Both engines, the tail and horizontal stabilisers were sheared off as the jet spun 360 degrees before coming to rest by the side of runway 28L. Horrified onlookers could only watch as a huge fireball briefly erupted upon impact, followed by a dark plume of smoke as the aircraft came to a halt. During training, cabin crew are taught to wait for a command from the flight deck before evacuating an aircraft, unless the situation is clearly catastrophic. 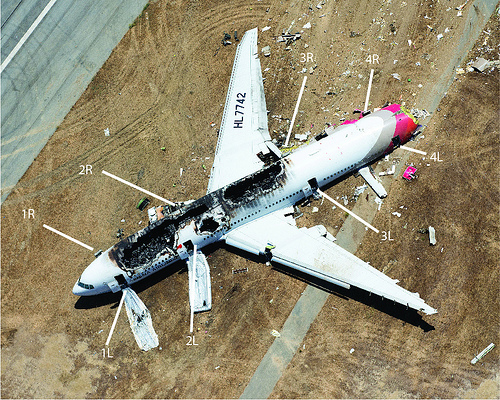 Many would agree that Asiana 214 was a catastrophic crash. After impact, Lee Yoon-Hye ran into the flight deck to ensure that the pilots were still alive and to see if they should begin an evacuation. However she was initially told to hold off, as the pilots tried desperately to make contact with the tower. An announcement was made telling passengers to remain calm and in their seats. Over 90 seconds later, after a crew member at Door 2L spotted fire, the call was finally made to evacuate the jet. The burning wreckage of Flight 214. Now the cabin crews training really kicked in. Doors were flung open, slides inflated and passengers began to evacuate from the stricken jet. Two of the emergency slides (at doors 1R and 2R) deployed inside the fuselage, due to the damage sustained during the crash, pinning two cabin crew underneath and rendering them incapacitated. 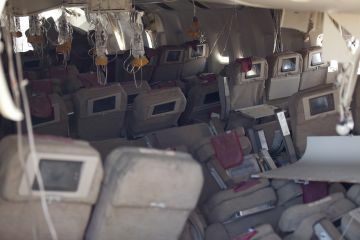 Passengers seated towards the rear of the B777, where many of the most seriously injured were seated, had to fend for themselves as two of the crew stationed here had been ejected when the aircraft impacted the ground. The two pinned beneath the emergency chutes struggled in vain to free themselves. One was eventually rescued by a pilot who used the crash axe to free her just moments before she suffocated. The second, trapped at door 2R was also eventually freed, “I grabbed a knife passengers had eaten with from a cart and handed it to the co-pilot and he punctured it” Yoon-Hye later said. Picture showing the location of doors on the Boeing 777. There are no procedures in our manuals or in our training, for us to follow in this type of emergency. The crew that day acted on impulse to free their trapped colleagues and drag them to safety. Slowly passengers began to escape from the burning wreckage. Unbelievably, photos emerged of people carrying off their hand luggage, despite our constant reminders to leave everything behind as it can severely impede an evacuation. One was even captured with their duty-free shopping. 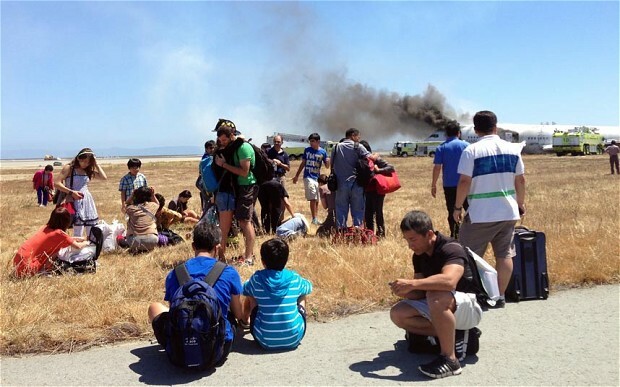 Passengers, some complete with their luggage, sit in shock after evacuating the burning jet. In the cabin, Yoon-Hye began fighting the fire that was now burning through the fuselage, while continuing to help with the evacuation. She made several sweeps through the wreckage before thick black smoke made it impossible. The devastation inside the cabin is clear from this picture and it is a miracle that so many survived. She later told the Associated Press “I wasn’t really thinking, but my body started carrying out the steps needed for an evacuation. I was only thinking about rescuing the next passenger”. As fire and rescue services arrived knives were thrown up to the crew still onboard so they could cut free passengers trapped by their seat-belts. They continued to scour the plane until everyone had been evacuated, risking their own lives as the plane burnt around them. 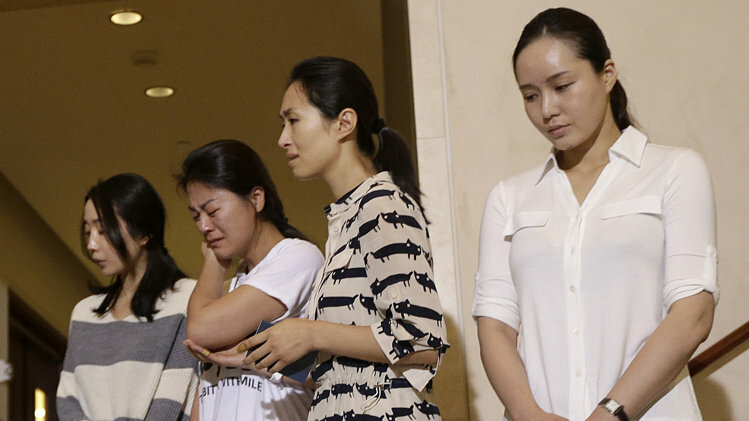 Lee Yoon-Hye was the last person to leave the B777. She had a broken tailbone and must have been in terrible pain. Joanna Hayes San Francisco Fire Department (SFFD) Chief said that Lee, “Was so composed I thought she had come from the terminal. She wanted to make sure that everyone was off…….She was a hero”. One passenger, Eugene Anthony-Rah who had been sat in business class described the scene to the Wall Street Journal and spoke of the true bravery of one of the flight attendants, “She was a hero. 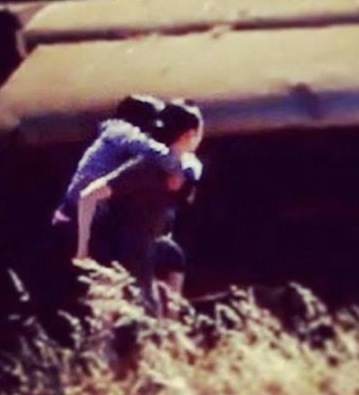 This tiny little girl was carrying people piggy-back, running everywhere, with tears running down her face. She was crying, but she was still so calm and helping people”. One flight attendant was captured carrying a young boy to safety. Less than a minute and a half after the evacuation of Flight 214 was ordered, all 307 passengers and crew were off the aircraft. 180 people were seriously injured, but incredibly there had only been two fatalities at the scene – a further passenger died later in hospital. It is a true testament to the skill of the crew that everyone managed to escape so quickly, especially as only half the exit doors were in operation. Edwin M. Lee, mayor of San Francisco said “We’re lucky to have so many survivors”. What was, and still is frustrating for cabin crew, is that during the initial hours following this crash and so many others around the world, little is said of the true heroes of the day, the Flight Attendants. In any accident WE are the ‘first responders’ not the fire crews, paramedics or police. We become all these professions rolled into one. We are the ones passengers will look to first when an incident occurs. We will be the first to help them from a stricken aeroplane and treat any injuries as best we can. The crew of Asiana 214 have totally re-enforced this fact, especially as many of the survivors spoke of the delay in getting the rescue services to the aircraft. As the days passed after the crash, stories emerged of the bravery and skill of the Asiana cabin crew. Their actions are a true testament to the real reason we are onboard any aircraft. Four of the heroines of Asiana 214, including Lee Yoon-Hye. And it wasn’t just the Flight Attendants on Flight 214 that showed their professionalism that afternoon. Waiting to take-off as the ill-fated jet landed was United Airlines Flight 885. Passengers seated on the left side of the Boeing 747-400 were first hand witnesses to the terrible crash and its aftermath. For the crew onboard it must have been a terrifying sight to witness, knowing that their colleagues, albeit in different uniforms, were battling to save lives. Yet during the three hours that they had to sit on that tarmac, they remained the consummate professionals we are trained to be. The First Officer on Flight 885 later made a statement to the press and spoke of their bravery, “We made numerous PAs to the passengers telling them any information we had, which we acknowledged was going to change rapidly, and I left the cockpit to check on the flight attendants and the overall mood of the passengers, as I was the third pilot and not in a control seat. A couple of our flight attendants were shaken up but ALL were doing an outstanding and professional job of handling the passenger’s needs and providing calm comfort to them. One of the flight attendants contacted unaccompanied minors’ parents to ensure them their children were safe and would be taken care of by our crew. Their demeanour and professionalism during this horrific event was noteworthy”. United Airlines 885 is towed back to the terminal past the wreckage of Flight 214. So next time you are sat onboard an aircraft, remember that your Cabin Crew are not there to cater for your every whim, we are there, primarily for your safety. I once heard a fantastic quote from a flight attendant in America who was making the obligatory, yet often ignored safety demonstration “The most important safety feature we have onboard this aircraft are……..the flight attendants. Please look at one now”. The actions of the ‘Trolley Dollies’ onboard that Asiana B777 proved just that. My fellow airline colleagues and I, from all around the world are the most important and best safety feature onboard any aircraft. No one knows how we would re-act should the worst happen, I hope none of us will ever have to find out. But if I can be half as brave, courageous and professional as the crew on Asiana Flight 214, I think I can safely say it would be a job well done. And so – Lee Yoon Hye, Yoo Tae Sik, Han Woo Lee, Hong Jung-Ah, Hyun Sook Young, Jeon Soo Min, Kim Ji Youn, Kim Yoon-ju, Lee Jeong Mi, Lee Jin Hee, Maninart Tinnakul and Siritip Singhakarn all join our Angels Of The Sky. Thank’s for the great blog entry, I just had to copy the link to it to my own blog (which is in German). 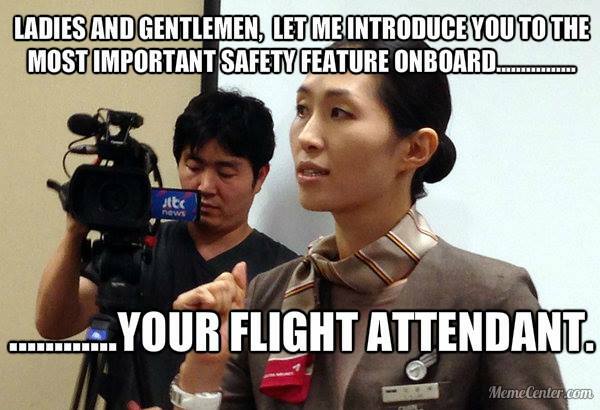 We all hope that we will never be in such a situation and if that we act like the crew on Asiana 214.
well said! truth to be told, I have taken Asiana Airlines numerous times over the past 1 year, and I have to thank all the flight attendants for their assistance through the flight. Thank you Asiana! absolutely take my hat off to them. They should be so proud of their bravery and courage and determination. Beautiful article. Just one small remark, the plane wasn’t coming in too fast, it was actually too slow. That’s why they didn’t manage to perform the go around: the plane was right at the edge of stalling and didn’t have enough speed to initiate a climb before hitting the ground. Hats off for the rest of the article, though. That cabin crew certainly deserves lots of praise, and it’s nice to see passengers reminded of the real reason why these “trolley dollies” are on board. To be fair Anne I did change the wording after Michel pointed it out to me! Thank upi all for potecting us everytime we fly! It’s truly amazing so many people survived and a credit to the dedication of the crew! Thanx for the post. 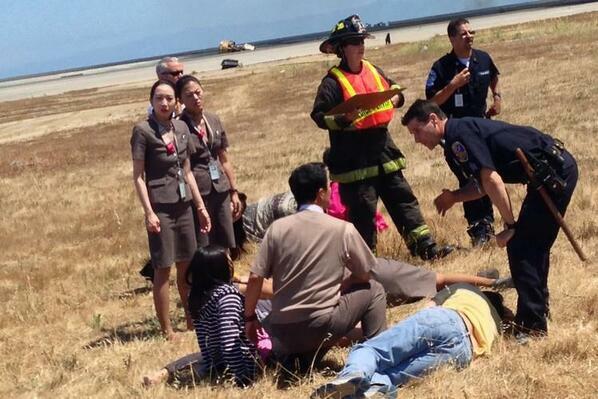 It warms my heart to hear about the great work of the asiana flight 214 crew. I hope and wish to be as courageous as they were, if anything would happen on one of my flights. 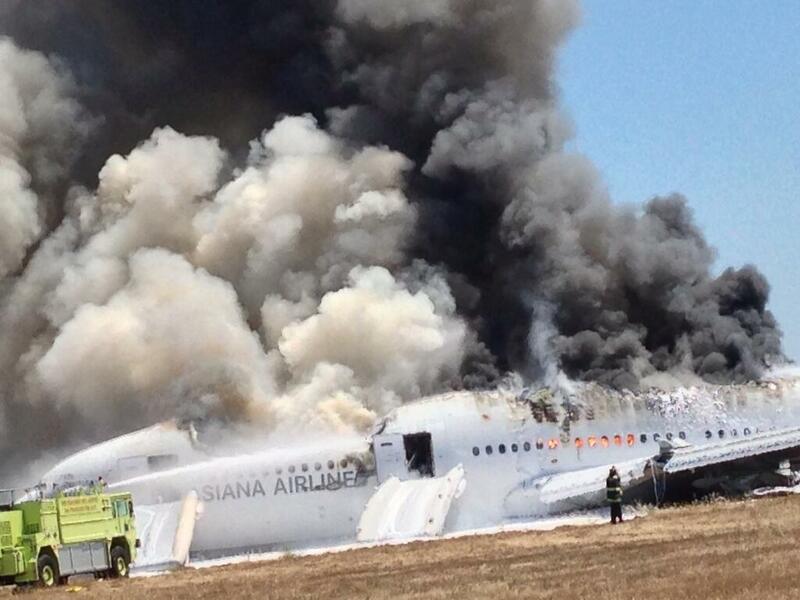 The Aviation Family are so grateful that -that Asiana crew signed on for flt 214 that day! Thank goodness they had a sound knowledge and understanding of emergency procedures -led by an experience Cabin Manager. We rejoice in your survival and hope your recovery from this trauma departs as speedily as it arrived. As a retired airline Captain, I am well aware of the devoted professionalism of the cabin crew. Hopefully a message will get through to the travelling public to not only listen to the cabin crew safety briefing, pre-flight, but mentally plan their own emergency reactions in a worst case scenario. It really could save your life and the lives of others! Congratulations on your article. wow~~~ I almost cried reading this ^_^. As a cabin crew I can ‘see’ the situation these crew must have gone through. The screams, the yelling, the mess, the pain. But its also the training that we all go through with little knowledge known to the outside world that saved every person on that plane. Bravo to the crew staying professional. Bravo to anyone whom spent the time reading this. And Bravo to the writer whom wrote this. Fortunately, I have never had to witness a flight attendant doing their ‘real’ job! Lovely post. I was in SFO due to fly home the day this happened. Have nothing but respect for the cabin crew for what they did that day. Amazing. Reblogged this on MARILEN KAMAU. Apparently in Singapore, Flight Attendants are not considered Profession, but categories in the same league as ‘domestic helpers’. Angels in the sky is right. I’m also a flight attendant, and agree 100% with everything you said here. Look now to the most important safety feature of this aircraft…. Your flight attendants!